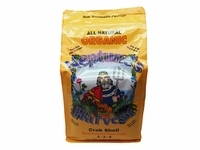 Neptunes Harvest Organic Crab Shell is an excellent dry organic source of NPK, Calcium (23%) and Magnesium (1.33%). It will also help with nematode and fungus problems. Here's why: Crab Shell is high in Chitin (Kite-en), which promotes the growth of Chitin eating bacteria in the soil. The exoskeletons of fungus and nematode eggs are high in chitin.